Pete Dunne and Walter team up against the Coffey brothers in the main event of a loaded episode of NXT UK that also featured the NXT UK in-ring debut of Kay Lee Ray. Flash Morgan Webster and Mark Andrews take on James Drake and Zack Gibson to determine who will face Moustache Mountain at Takeover, and Xia Brookside has a very entertaining wrestling match with Isla Dawn on a good episode of NXT UK. Moustache Mountain took on Gallus in a semifinal match of the tag title tournament, Jinny tried to figure out Candy Floss, Barthel and Aichner had a dominant performance against Williams and Jordan, and Travis Banks had an easy night on an entertaining episode of NXT UK. 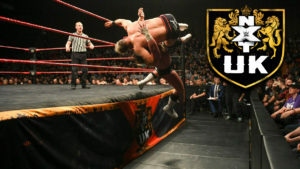 Ligero tries to impress in a match against Joe Coffey, Jordan Devlin is mildly surprised by Kenny Williams, and some big announcements are made on a good episode of NXT UK.